What are electrolytes? Electrolytes are certain nutrients (or chemicals) present in your body that have many important functions — from regulating your heartbeat to allowing your muscles to contract so you can move. You obtain electrolytes through eating different foods and drinking certain fluids, while you lose them partially through exercise, sweating, going to the bathroom and urinating. This is why a poor diet, too little or too much exercise, and being sick are some possible causes for an electrolyte imbalance. Electrolytes are found within bodily fluids, including urine, blood and sweat. Electrolytes are given their name because they literally have an “electric charge.” They separate into positively and negatively charged ions when they’re dissolved in water. The reason this is important is because of how nerve reactions take place. Your nerves signal to one another by a process of chemical exchanges dependent on oppositely charged ions, both outside and inside of your cells. 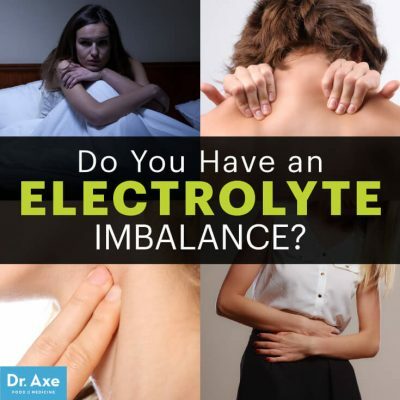 To diagnose an electrolyte imbalance, your doctor can perform a few different tests to determine your electrolyte levels. Most likely your health care provider will discuss your medical history with you, any reoccurring symptoms you experience, and take a urine and blood test to identify any abnormalities. It’s also sometimes necessary to have an EKG test, ultrasound or X-rays of your kidneys in order to look for severe electrolyte imbalances that can put you at risk for heart complications. Changes in Heartbeat: When potassium rises to very high levels, a condition called hyperkalemia develops. This interferes with the normal signals sent from nerves to muscles, which can result in muscles becoming weak, tingly or numb. At the same time, high potassium can impact your heartbeat and cause rapid rhythms that make you feel anxious. Also, one of the main effects of high calcium levels is on the cardiovascular system and electrical transmission pathways of the heart, so very high calcium levels are another common cause of heartbeat changes. Anxiety and Trouble Sleeping: Most of us know how hard it is to fall and stay asleep when we have muscle spasms, a fast heartbeat or night sweats. Despite feeling like you’re always tired, low magnesium levels and high potassium can cause trouble getting good rest because of ongoing pains and mental disturbances. Muscle Spasms: When dehydration occurs or potassium and magnesium levels fall abruptly, muscle weakness and spasms are usually some of the first signs. Very low potassium levels (hypokalemia) can also cause cramps and constipation. Low calcium levels (hypocalcemia) also causes muscle spasms, cramps, abdominal muscle pain and convulsions. Digestive Issues: The muscles within your digestive tract need to contract properly in order to help you go to the bathroom. So either high or low levels of electrolytes can result in diarrhea, constipation, cramping or hemorrhoids. Nausea is also sometimes caused by very low sodium levels (called hyponatremia). This same condition can be followed by headaches, disorientation and respiratory problems when it’s left unresolved. Bone Pains: Very high calcium levels (called hypercalcemia) can result in bone fractures, painful kidney stones, vomiting and constipation. The same condition can also make you feel tired and weak, with trouble concentrating. Confusion, Dizziness and Irritability: When your sodium levels rise too drastically (called hypernatremia), you can become dizzy and weak. When this worsens, it’s possible to become even more delirious and even experience a seizure or coma. 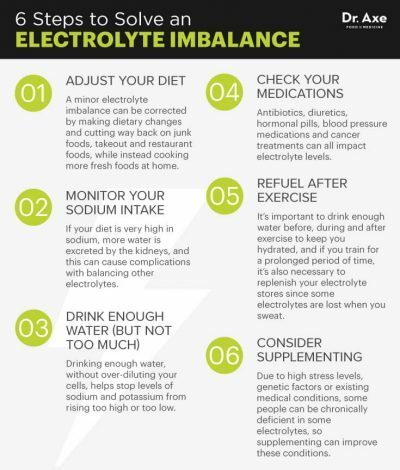 The first step to correcting an electrolyte imbalance is to identify how it developed in the first place. For many people, a poor diet that’s high in processed foods containing lots of sodium, but low in other electrolytes like magnesium or potassium, paves the way for a dangerous imbalance. In many cases, a minor electrolyte imbalance can be corrected by simply making dietary changes and cutting way back on junk foods, takeout and restaurant foods, while instead cooking more fresh foods at home. Focus your diet around whole, unpackaged foods — especially plenty of vegetables and fruits that provide potassium and magnesium. Some of the best include leafy greens, cruciferous veggies like broccoli or cabbage, starchy vegetables like sweet potatoes or squash, bananas, and avocados. A diet that’s rich in magnesium or potassium likely can be enough to solve problems like low potassium levels that can lead to blood pressure problems or magnesium deficiency that can contribute to anxiety, restlessness and muscle cramps. Another thing to consider is whether you’re consuming enough calcium. With or without eating dairy products, it’s possible to get calcium from leafy greens, other veggies, beans and legumes. To obtain enough calcium naturally without needing supplements, consider adding high-quality and ideally raw dairy products to your diet if you can tolerate them. Foods like organic probiotic yogurt, cultured raw cheeses and raw milk provide high levels of electrolytes in addition to other important nutrients. When you do consume packaged or processed foods, check the sodium levels. Sodium is an electrolyte that plays a significant part in the body’s ability to retain or release water, so if your diet is very high in sodium, more water is excreted by the kidneys, and this can cause complications with balancing other electrolytes. Here’s how sodium works within the body: Essentially, water follows salt, which means if you increase sodium too much, water retention also occurs. At the same time, the opposite is also true: A loss in sodium results in a loss in water, potentially causing dehydration and extreme thirst. Hypernatremia (the name of the condition that develops when either too much water is lost or too much sodium is obtained) is more common among older adults, people with diabetes and those who eat heavily processed diets. People can also lose a high level of sodium through diarrhea, taking certain diuretics or laxatives, and exercising to extreme levels and overtraining without staying hydrated — all of which cause problems of their own. Monitoring how much sodium you consume helps keep symptoms at bay, including bloating, lethargy, dehydration, weakness, irritability and muscle twitching. Drinking water and eating mostly whole foods (not the kinds that come in packages!) also ensures you obtain enough other important electrolytes. Electrolyte imbalances can develop when the amount of water in your body changes, either causing dehydration (not enough water compared to certain elevated electrolytes) or overhydration (too much water). Drinking enough water, without over-diluting your cells, helps stop levels of sodium and potassium from rising too high or too low. How much water is the right amount for you? It all depends on your specific needs. Do you exercise often? Do you live in a warm climate that results in you sweating? Do you eat a lot of water-rich fruits or vegetables, or more processed foods? While “eight glasses a day” has always been the standard recommendation, this isn’t necessarily the best amount for every person, since factors like your diet, age, physical activity level and body size all determine how much water you need. A good rule of thumb is to drink enough so you urinate at least every three to four hours, which for most people is around eight to 10 eight-ounce glasses daily. If you practice vigorous exercise (especially in warm/hot weather that increases sweat production), make sure to replenish with plenty of water and electrolytes (like premade formulas that include sodium). If you’ve been sick (including with a fever that causes vomiting or diarrhea), keep in mind that you lose fluids and should increase your intake. If not, you risk developing dehydration symptoms, kidney stones, bladder infections, urinary tract stones and potentially even heart failure. That’s why it’s so important to protect yourself from dehydration. Women who are pregnant or breast-feeding also need additional fluids (about 10–13 cups every day) to stay hydrated and prevented deficiencies, as do teenagers who are growing and developing faster than people of other ages. Is it possible to drink too much water? Over-hydration is rare, but yes, it’s possible. Your kidneys are unable to excrete very high levels of excess water, so this can mean electrolytes within the blood can become diluted. The result might be low sodium levels, which is more common among endurance athletes (who often try to compensate for sweating by drinking lots of water) but not very likely to develop in someone eating the standard American diet that’s high in salt. Antibiotics, diuretics, hormonal pills, blood pressure medications and cancer treatments can all impact electrolyte levels. The most serious forms of electrolyte imbalances are usually seem in cancer patients receiving chemotherapy. Their symptoms can be very serious when not properly managed and include high blood calcium levels or other imbalances that develop when cancer cells die off. Laxatives or diuretics also change potassium and sodium levels within the blood and urine. Certain diuretics are considered “potassium-sparing,” meaning they can cause potassium levels to stay very high while other electrolytes like sodium, calcium and magnesium can fall very low. This results in anxiety, fast heartbeats, digestive issues and trouble sleeping. It’s also possible to develop electrolyte imbalances due to hormonal interactions from antidiuretic hormone medications, aldosterone and thyroid hormones. Even high levels of physiological stress can impact hormones to the point that fluid and electrolyte levels become thrown out of balance. If you’ve started a new medication or supplement and notice changes in your mood, energy, heartbeat and sleep, talk to your doctor about possibly changing your dose to minimize electrolyte imbalance risks. Fluids and electrolytes (usually in the form of extra sodium) are commonly consumed by athletes during or after training. Replenishing electrolytes has been a well-known recommendation for years and is why sports drinks and enhanced waters are popular among people who are very active. It’s important to drink enough water before, during and after exercise to keep you hydrated, and if you’re training for a prolonged period of time, it’s also necessary to replenish your electrolyte stores since some electrolytes (especially sodium) are lost when you sweat. You need to drink extra water to compensate for the fluid loss of being active, about 1.5 to 2.5 cups for shorter workouts, and about three extra cups for longer workouts that are more than one hour. Without enough water present in your body, dehydration and deficits can cause cardiovascular complications (changes to heartbeats), muscle cramping, fatigue, dizziness and confusion. Not only does this hurt your overall aerobic performance, but it can cause you to pass out or in rare circumstances even experience serious issues like a heart attack. Both water and sodium need to be replaced after workouts to re-establish “normal” body water levels. You don’t need to go nuts guzzling down tons of water after a workout, but make sure you eat a balanced meal afterward and have some water throughout the rest of the day. If you notice yourself feeling dizzy or heavily cramping up, try drinking lots of fluids immediately and consuming electrolytes until you feel better. Due to high stress levels, genetic factors or existing medical conditions, some people can be chronically deficient in some electrolytes. Magnesium and potassium are two electrolytes that many people are low in. Taking magnesium supplements daily can help replenish stores and prevent magnesium deficiency that’s responsible for symptoms like anxiety, trouble sleeping or muscle cramps. Potassium and magnesium are usually present in mutlivitamins, just be sure you take a high-quality, food-based vitamin in order to properly absorb these electrolytes and not any supplements that are toxic and full of junk.